All transactions are safe and secure with a reliable history in online purchasing behind each of our associates. Buy the Lost Drive Shaft shirt to own Lost clothing and merchandise. Rock on and show your support for Charlie's old band with this Drive Shaft tee that features the band name on the front in the form of the Drive Shaft logo. Perhaps Oceanic World Air would be willing to sponsor the band in the future. 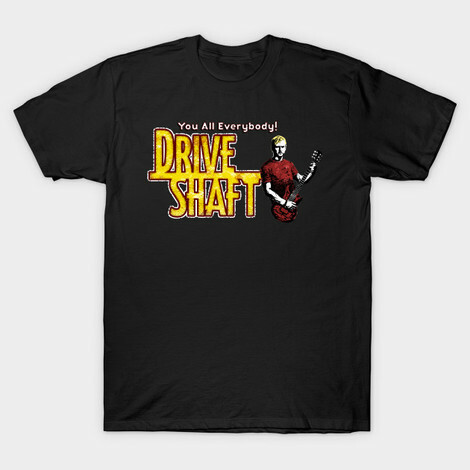 Wear this Drive Shaft Lost shirt to let everyone know that you're a fan of the band that released the hit song, "You All Everybody." Celebrate the Lost TV show with this unique design, available on over twelve different forms of apparel, including Lost sweatshirts and hoodies. In addition to the Lost Drive Shaft tee above, browse the Lost Clothing Gallery for more apparel like men's and women's clothes, kids shirts or hoodies.